The animations are un-intimidating and hand-drawn. 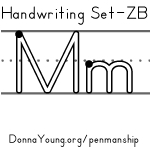 While both lowercase and uppercase letter m can be drawn without a pencil lift, many times, uppercase M is taught using one pencil lift or with two strokes. Animations are included for both variations of uppercase M.